Every mother is a superhero in her children's eyes. So is actress Scarlett Johansson to her 3-and-a-half-year old daughter Rose Dorothy Dauria. The 33-year old may play Natasha Romanoff/Black Widow in the Marvel's production, but according to Rose, she's always a superhero. 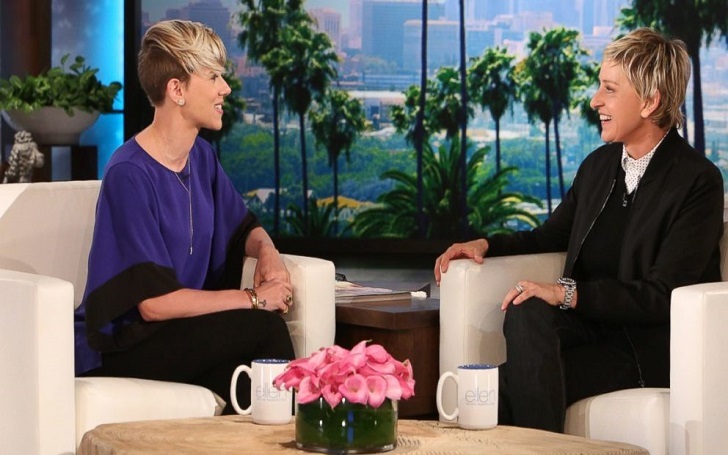 The Avenger's actress paid Ellen DeGeneres a visit on her show, The Ellen DeGeneres Show on Tuesday, April 24 in the name of promoting her upcoming release Avengers: Infinity War, where she told the host that her time and effort participating in the franchise has led her daughter to believe her mom is actually Black Widom full time. We had taken a break in shooting Infinity War because it was an extremely long shoot. I was going into the office — I was not doing anything film related, I was like, ‘See you later, honey, Mommy has to go to work. I don’t know if that’s a good thing, but yeah, she thinks I fight people for a living. If anybody has a regular uniform that they normally wear to work, mine’s a pleather unitard. Scarlett who's currently in a relationship with Saturday Night Live writer Colin Jost, shares Rose with ex-husband Romain Dauriac. She likes being a mother, admitting parenthood gets better every day. And New York is not the best place to have fabric dragging around behind you. But she’s a princess-obsessed little girl. New Mansion, New Policy: Kim Kardashian's Home Is Now Jewelry Free!